If you have a form in Microsoft Forms you don't need anymore, you can easily get rid of it. Go to the Microsoft Forms portal at forms.office.com, and then sign in with your Office 365 school account, Office 365 work account, or personal Microsoft account (Hotmail, Live, or Outlook.com). Find the form you want to delete in the list of forms, click More form actions in the upper right corner of the form preview window, and then click Delete. To confirm the form will be moved to the recycle bin, click Continue. Note: If you've signed in with an Office 365 school or work account, you'll also see a Move option, which allows you to transfer ownership of your form. Learn more. Note: Unless you intentionally delete a form that has been moved to the recycle bin, it will remain in the recycle bin indefinitely. Accidentally delete a form and need to get it back? Here's how. 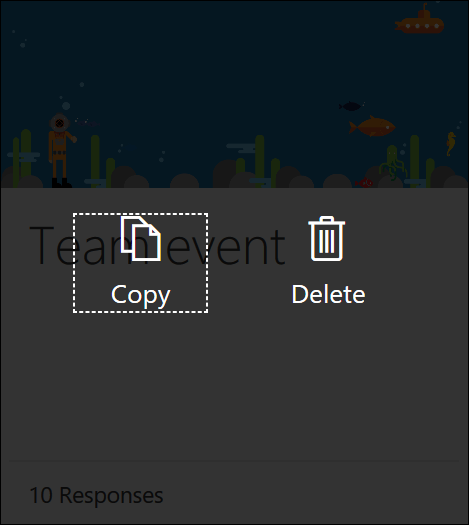 Click on the Recycle bin icon in the lower right corner of forms.office.com. Hover over the form you want to recover, and then click Restore. To see your recovered form, click on the Back to my Forms page arrow. Note: When you delete a form in the Recycle bin, the form and all of its responses are permanently deleted. Note: Each Forms user can create up to 200 single forms, which include those in the recycle bin. (For example, 150 forms in the Microsoft Forms portal + 50 forms in the recycle bin = 200 forms.